for a complete look at last night's results show. This is from the St. Lawrence River, in the area known as the 1000 Islands. 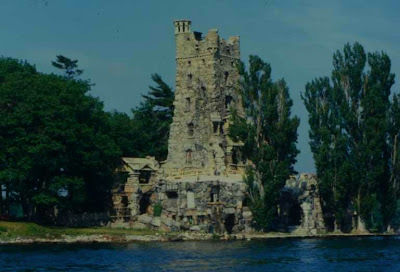 Boldt Castle is known for it's sad tale. Built at the turn of the century by multi-millionaire George C. Boldt for his wife, Louise, as a testimony of the unsurpassed love of a man for his wife. Boldt invested over $2.5 million to build this replica of a Rhineland castle, bringing in the finest of artists and the most skilled craftsmen for this project. He planned on presenting it to his wife on Valentine's Day as a monument of his love for her. Work was underway on the eleven buildings that would comprise the castle complex when tragedy struck. In January of 1904 Louise Boldt died, ending the dreams of a lifetime. Heartbroken, Boldt telegrammed his construction crews ordering that all work be stopped. Three hundred workmen dropped their tools and left the island. Boldt never returned to the island, leaving it instead as an unfinished monument of a love story cut short. If you would like to know more of this tale, you can find it HERE. Wanted to brag on my nephew - sister Lynn's son - Joe today. Joe is a swimmer and as you regulars may recall, Matt and I got to see one of his meets last March when I was up in the NY area on business. 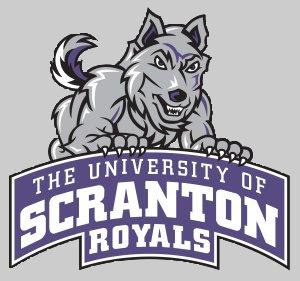 Joe selected the University of Scranton with no promise of time on the team from the coaching staff. I think everyone thought, if he could get a few races under his belt he would be good to go for next year when he was a Sophomore and some of their strong Seniors had graduated. Well...that was the presumption...What we could not expect is what has occurred the first three meets of the season for Joe and for the Royals Swimming Team. Meet one had Joe take second place in the 100 yard Butterfly AND he was the second leg on the WINNING 200 yard Freestyle Relay team. The Royals beat both FDU and Cabrini in this dual meet. Meet two was even more amazing...Joe responded to his coache's decision to put him in the middle of the mix and took FIRST PLACE in the 1000 yard freestyle; FIRST PLACE in the 500 yard freestyle and swam the anchor leg for the 400 yard freestyle relay race (they came in 5th). The Royals beat Widener in this meet, a team they have had troubles with over the years. This past week, the Royals took on the team from Dickinson and lost 104 - 101 for their first loss of the season. Joe swam three races and took second in all three; the 1000 yard freestyle; the 200 yard butterfly and as part of the 400 yard freestyle relay. Then yesterday it was announced that Joe was named the University Of Scranton Athlete Of The Week! If I know Dad Vince, he will be sending an email to everyone he knows sending them over here to read this portion of the post! hehehehehe...THANKS DAD! Looks like I found an alternative to lifelogger. It involves two different sites; one to upload to and the other to convert for use on the blog. PLUS, the one site that stores the music only allows like 3 GB of free storage. After that it costs and with all the music I use on The Couch, I am not sure the financial portion of this is an option. BUT, lifelogger is MIA..when you go to the site, I get a message saying that there was a hiccup and try again later or write to support. Well support at lifelogger has NOT ONCE WRITTEN ME BACK - NOT ONCE - over the years...so I am not expecting anything back from them. I'm glad the castle has since been restored. Way to go Joe! Do I see a box of Wheaties in his future? My cousin was a swimmer, I always admired her ability. Congratulations to Joe. It's great fun when there is someone in our family that is truly good at something and we can celebrate their success. That's very nice for Joe and his team and family. I love little bits of history with a personal touch---where were you when you took the photo? Congrats to Joe. Is he Italian? I didn't think oil and water mixed. Cheers Vinny!! ANNDI: It is a beautiful place...He is talented. TURNBABY: Thanks...sure..I was in a rented speedboat and the four of us were cruising the river. We were there for the wedding of a fraternity brother. Ha. He must be the only competitive swimmer who is always angry, drunk, and pasty white. Cheers!! Oh I love that castle! Looking at huge, old homes have always interested me. It's always good when people can donate funding to "bring back" the sweetness of history. Thanks for sharing the link so we could visit the main castle and many of the other buildings! Out of respect for your Dad, I'm not touching that speed and oil comment... nope. Many congrats to Joe - that is AWESOME!! WAY TO GO JOE! Most excellent indeed!!!! Wow! Hopefully Joe is reveling in his accomplishments as well! Hard work does pay off!! your photo is fantastic - I saw it as a giant sand castle built by the Gods. I love the mossy green hue. Nice blog today. Thank you for all the good wishes for Joe! It has been exciting watching Joe swim. This weekend he swims at Goucher College in Maryland. Joyce and Racid live only an hour away, so they are going to attend. We will keep you posted! Congratulations to your nephew Joe. Athlete of the week is pretty cool! This is a great photo, Vinny. It really looks like a painting. Guess money can't buy good health. His wife died, even though he was super wealthy. Guess I'd rather be poor and healthy. Good luck in Roger's contest. The photo is sad. It has the look of something organic, like a tree stump that is being weathered by exposure to the elements. Dead, but not gone yet. But a sad reminder of the love once in bloom going away. I have heard the story of Boldt castle from my in-laws; they visited there a couple of years back, and Dad took dozens of photos. Heartiest congrats to your nephew, Joe. Wooooooohoooooo! Awesome shot and equally great info my man! What an amazing story! Beautiful photo of the unfinished castle!